​I see my role as your Doula to be a matchmaker; to connect the dots of people who can support each other in a naturally symbiotic manner so that everyone can get what they need! There are so many supports out there, and so many people needing help, but often as a new parent, it is overwhelming to find them on your own. Not to worry, I can help!! How do I do this ? So many easy and effective ways!!! I regularly accompany new parents to local events-Breastfeeding Support groups, Story Times, Playgroups. With the extra set of hands, it can make the overwhelming task of getting out of the house slightly easier. These often are low-risk social situations and wonderful settings for a first outing with a baby. Being among other parents who don't mind you nursing, changing a diaper, or wiping spit up publicly, it can be a comfortable way to explore your community and the wide support that may already exist in your area! It often is also a casual and fun way to gauge where your baby is developmentally in comparison to their peers and where they may be a short time from now! I am very good at by providing accurate, reliable information, when you need it! It breaks my heart to hear about new parents Googling answers. Don't do it!! I am happy to pass along material I have found and trust, that is rooted in scientific research and not written by a mom blogger with a strong opinion. Teething, sleep training, breastfeeding-there are so many conflicting ideas out there!! Don't overwhelm yourself with trying to do research. Let me take care of the legwork and let's troubleshoot one or two ideas together that feel appropriate and manageable for you and your baby. 3. Reminder: YOU are the Expert! So many times after working with a family, I hear a new parent say, "If you have a client going through the same thing, please give them my number!" When you find something that works, you want to share it. Rather than getting all the answers from a book, I absolutely love to connect families for two reasons. First of all, it is an opportunity for both families to troubleshoot and solve their own problems, and simultaneously celebrate their success. Also, it allows the experienced family to feel confident in their role as a new parent to be able to pass along a bit of wisdom. And really, it can make a world of difference to both families- real life advice from people who are at a similar stage beats an expert almost any day. Let's face it-a baby can rock your world in a good, but incredibly challenging way!! Instead of trying to do it all yourself, I am happy to support families during the postpartum period. The goal of my support is to figure out a series of routines, and tools to make this parenting job easier for you, to the point where you feel that you can manage to do most of it independently. That may look like establishing a sleep routine, organizing newborn clothes, or setting up a nursing station so all your supplies are ready when you need them. It is not about reinventing the wheel, but rather putting together ideas that make sense and allow you to thrive where you are with what you have already. It is incredibly rewarding for me to see how efficient parents become over time with a little help from me in the beginning!! One of the easiest and most effective things I do with clients is to create a list of people they can call upon for favors once baby arrives. Not anything huge-but people nearby who you could ask to watch the baby for an hour, to shovel your steps, to take out your dog, to pick up a few groceries. Make a list, with that person's phone number and post it somewhere visible, long before you need help. When you may be needing some extra support, it is simple for you or I to contact someone for some help if their information is in sight and ready to go. 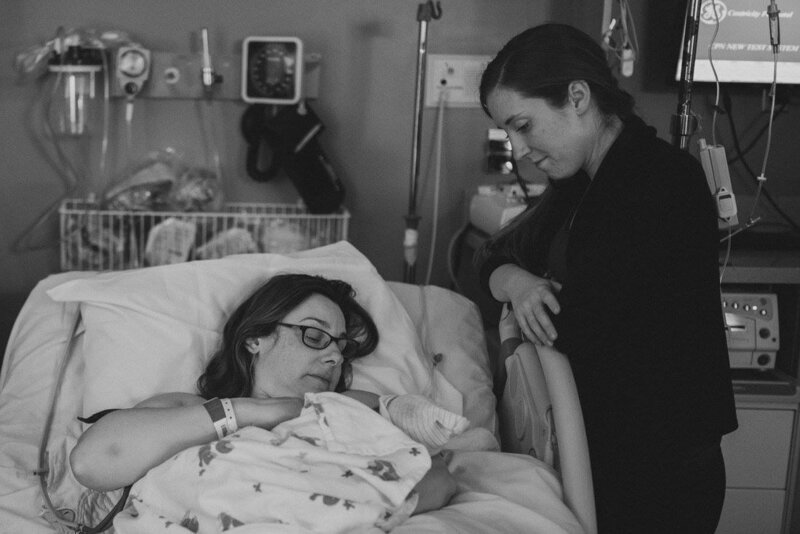 The role of a Doula is to provide emotional and physical support a family before, during and after birth. They are an amazing resources to assist you connect the dots of support that may already exist in your own world. One of the most empowering things I can help families discover is that they already possess the tools they need to be parents to their little one, if we work together thoughtfully and strategically. You've got this, I promise! But in the meantime, I am here to help you figure it out! 1. Please stop calling it a fight. A fight implies that there is a winner and a loser; that odds can be calculated and the strongest will prevail. It sets up an opposition- of good vs. evil. And creates a sense of blame for the individual who might not beat the odds. Cancer is not a survival of the fittest. It can make no sense the victims it selects. Please don't add blame and guilt to people who cannot be considered "survivors". When our mother was sick, we got so much. I am forever endebted to the kindness of a community that loved and supported us in our hardest times. However, to some people's dismay, it is not the financial gifts I appreciated the most, but the presence, kindness and respect of others. I remember neighbors who offered to drive my mom to appointments so my father could work. Art projects from her former students. Cards in the mail from people far away. Prayer chains, drawings from children and hot meals made us feel supported. We were fully "aware" of breast cancer. On the contrary, we desperately wished to forget about it for those 5 minute amnesia spells where we went back to normal. Instead, we loved a phone call, a walk, a new Netflix recommendation or a funny book. We looked for distractions from, not reminders of this horrific illness that permeated our routines. 4. Remember It's Not a Fundraiser. Medical evolution happens in biology labs, through medical trials and due to the ingenuity of doctors. It is not more money that we need, but more people qualified to ask questions and study information. If you want a cure, encourage more people to pursue higher education for someday they may be capable of discovering information that can transform people's fate. Maybe the best way you can honor those with breast cancer this month is by taking charge of your own health-men, women and children. Seeking preventional care can be nearly miraculous in fending off serious illnesses. Mothers well-being sets the tone for her children. Wellness has no end to the ripple effects it causes in a family-for better or worse. So figure out in what way you might improve your well-being this fall. Maybe that is going to bed earlier, or getting outside a little more. Maybe it's making an appointment with your OB/GYN for that Pap smear you've put off. Maybe it's meditation, pursuing education, breaking off an unhealthy friendship or saying "no" to things that overwhelm you. However you choose to be aware this month, remember that noticing a problem is not the same as resolving it. Be mindful of those who may be struggling and choose to give, recognize and cure thoughtfully with love and not just money. This year, I enter with a somewhat clear vision of who I am, what I need, and what work needs to be done. And so, I present to you my goals for this exciting, upcoming year! 2. Read at least once a day. Confession: I am a SLOW reader. 3. Spend energy on/with things that bring you more energy. Seems like an obvious one, but much much easier said than done! For this, I mean eliminating taxing relationships and tasks for ones that ignite my spirit. For example, watching mindless tv might feel great in the moment, but often leads to hours wasted. Or could be a quick pick me up after a long grueling birth. Nothing is set in stone. A conversation with a friend can be beneficial, but can sometimes feel like a chore. In the moment, I am going to resolution to guide me. The goal being-invest in tasks that make your future manageable and happier. 4. Return phone calls, texts, and emails promptly! I am great for clients when I'm on call! Not so great at day to day communication, leading to back-logged communication and planning conflicts. Quick responses are appreciated. I can do better! 6. Self-care is a necessity, not a luxury. Treat myself like a client. I don't need to justify a good night of sleep, or a massage. These are things that allow me to thrive, live well, and therefore do my job better. Simple as that. I have a lot of them, and they are only growing by the day. I have wonderful family, nearby and far away. They make me laugh, cry, and go crazy, but they are mine and they pretty awesome. Extended family included. 8. Say no when things aren't a good fit, or no longer have value or space. Evolve with the times. Value to me, has always resided in relationships with others. These don't fit forever. It's okay to make space for new opportunities, just as long as your priorities remain intact. 9. Write "Thank you" notes often. I owe my success to a wealth of individuals, and the more I seem to reflect on it, the more I notice it in the future. So what if it's the same people again and again. They still deserve acknowledgement for the difference that they have made in your life. 10. Love is a two-way street. Keep it balanced. I have a habit of loving the wrong people. You know, dropping my own responsibilities to help people who would be very unlikely to do the same for me...? And then because of this, being unavailable to help those who treat me like gold. In a world where "You get what you give", I just need to make sure I'm giving it to the people who value what I have to offer. And that's a wrap! No money-saving, calorie-counting, gym-going crazy talk, just me, hopefully making better decisions in 2018 that lead to a stream-lined life rich with people and experiences that make me feel fulfilled. Be patient and gentle; quiet and light. Remind her of what she did well. Ask about the good, the bad, the unspeakable. The gains, the losses, the disappointments, the exhaustion, the unbearable, the triumphs. Communicate your dedicated confidence in her; not as a “mother”, but as a woman, with vulnerability, confusions, anxieties, and insecurities, coupled with joy, relief, and a humbled sense of life. Love her for all of that. I guarantee she has a different version than you or her medical records capture. She has gone through an enormous transformation before your eyes. Do not take that lightly. Do not rewrite it for her. Curl up with that beautiful baby and bask in the afterglow of a new mom. Or cry raw tears of overwhelming fears. Or both. All at once. This week I have connected with some of my first doula families and discovered such a deeper element to a job that I already adore. It has been absolutely incredible to watch each of them grow in confidence as they become parents to this new, precious soul. That being said, I also like seeing them struggle, just a bit. Not because I want them to suffer, but because I believe growth happens in the struggle. I'm their doula, not their doctor, so I want to hear about the little things and the day to day emotional rollercoaster that all families ride together. I love the stories of meeting grandma for the first time and having a giant diaper blowout. I love the stories of her first bath where she peed all over dad. ​I love the stories of how she won't sleep unless you bounce her, sing her my favorite Bob Marley song then nurse her to sleep. I love the raw stories of sleep deprivation, tears of joy and exhaustion, and frustration over how much life has changed. I love the stories of tender moments after a startle. I love the the opportunity a new life provides for a family to reconsider their priorities. And I love the question "Am I doing this right?" ​In a world of mom shaming and Pinterest perfect parents, its refreshing to have a candid insight into family life because although it is not always pretty, it is a pretty amazing ride. I love the struggle, and I love being there to support families and to say, "Yes! You are doing the right thing for you and your baby!" My Godson learned to walk this week!!! Like anyone who has witnessed this milestone knows, it seemed to have happened overnight and now he can't ever imagine wanting to crawl. He just points his body in a direction and cruises, with a big, drooling smile on his face. Usually heading in the direction of whatever his older sister happens to be enjoying at the time. He walked later than his sister did, which didn't go unnoticed by his parents. Although they don't consciously compare children, it's hard not to assess one child's milestones as compared to their closest relative. He is a different child than his older sister. She liked to look at books, drive trains, and make silly faces, he prefers to snuggle in blankets, tend to his dolls and bounce up and down all day long. They both are very social and like to make people laugh. Both love to dance and ask for more food. When she gets hurt, she is silent for a moment, then laughs. When he gets hurt, he throws himself on the ground in misery. Both have incredible receptive language and an eye for mischief. Both I love so, so much! When I was teaching toddlers, I worked with an incredibly skilled teacher. She was experienced, motivated and simply magical with children. She would take pictures on a digital camera throughout the day and then look through them while the children were taking an afternoon nap. She used them to document the events of the year, showcase development, and improve teaching outcomes. I will never forget a conversation she had with me over a picture she had taken in our classroom one morning. It was a cold day, and we had set up an indoor climbing structure. She snapped a photo of me with a toddler, in a natural scene, without me knowing. "What do you see in this picture?" She asked. Such a typical teacher-phrased question, I thought. "I see me holding the hand of a student who is trying to climb the climbing structure"
She began to tell me, in a sweet, heartfelt way that although I believed I was helping, it wasn't the best way to support a child's growth. "It's okay for a child to only be able to climb up halfway", she said. "This means that they can do that safely and they know how to get back down. When they are ready, they might climb higher, or in a way that is more creative, but they will do it eventually when it feels safe for them to do so. It is not necessary for every child to reach the top every time. But it is up to us to appreciate how high they are able to climb on their own and celebrate the way they get there." From then on, I looked at helping children in a whole different way. Flash forward when I was teaching 4th grade in a high stakes inner-city school. Children were coming to me from various backgrounds of schooling from Latin American countries. They were being expected (by policy makers who do not know them) to be affluent in grade 4 Common Core curriculum. With every assessment they took, I found myself remembering the conversation with my mentor teacher about how children will climb as high as they can, and it is up to us as teachers to see how they got there and measure their progress as they make it just a bit higher each time. I cannot convince someone to change their mind. I cannot give them a band aid solution and expect success. People can do incredible things by stretching their own comfort zones a little at a time. Parents, please remember this. Be gentle with yourself. Be supportive with your children. But remember that it is not important that we all make it to the top the first time, but that we got there safely, honestly, independently, with a foundation of loving admiration. Ego check-I've always liked making and enforcing rules. And maybe.... just sometimes.... bending the ones that exist.. I have come to believe there are some essential rights that all mothers deserve and I subtly foster these and fiercely protect them with every mom I encounter. 1. You get to become a mother when, how and with whom you decide. No exceptions. 2. And if you find yourself pregnant in a situation that you never anticipated, you deserve to be supported in exploring all of your options. And there are always options. ALWAYS. 3. Not every person is born with a natural desire to be a parent, and that's perfectly fine. We, as collective humanity, need adults who can be alert, without mommy brain, running things when others can't. 4. Find healthcare that jives with your beliefs. Not all practitioners are created equal. Shop around. This person gets to accompany you in a major transition in your life, you better be able to have an honest conversation with them and not feel pressured into anything beyond your comfort zone. 5. Your pregnancy is incredibly unique. Whether its your first, or fifteenth. And there is not a right way to do anything. So get off Pinterest, Facebook, even the phone with your best friend if she's not making you feel like you're doing the best you can. Stop comparing yourself and your baby to other people's experiences. You have everything you are supposed to in order to become the right parent to this individual child. 6. It's not going to go how you plan. I'm so, so sorry. It just isn't. Your pregnancy. Your birth plan. Your baby photos. Your sleep schedule. Your emotional health. Your relationships. But that doesn't mean it won't be incredibly beautiful, fulfilling, and perfect in the way that it's supposed to be. I can promise you that you have what it takes to do it all, just make sure you laugh along the way. 7. There is nobody else in the world who could do this job better than you. Eventually, you will start to believe what your baby already knows-you are the expert. I've always been an emotional person. I don't cry over movies, or have outbursts in public. But I do feel deeply, and am affected by changes in my immediate environment. As a young child, I had imaginary friends. On some level this is appropriate for a first born child. I invented characters with complex personalities and rich backgrounds of things I had not experienced, but wish that I had. I would become involved in their "lives" and want to "help" them (sound familiar??). I would feel so intertwined with their struggles that multiple times, my parents found me crying over them. The truth is that this particular quality; the drive to become deeply invested in other peoples worlds around me, became my most cherished and simultaneously, most abused personality trait as an adult. I care. I can't turn it off. I don't know why or how or where limits may exist between my world and somebody else's. I worry about people I love, people I know, even people who I don't know. With this, comes great guilt when the support that a person requires falls outside my sphere of influence. For me, these are unresolved needs that to this day, can bring me to tears. In my classroom in Boston, we cried. A lot. Like, honestly, a ridiculous amount. Not a day went by that I didn't have a student in tears. I had a group of emotional kids, for whatever reason, who were given a highly emotional teacher during a year of great personal struggle. We cried a lot out of frustration, being misunderstood, from missing people, because we felt lost, for being overwhelmed, out of exhaustion, out of anger, out of love, out of tremendous loss and most painfully, out of fear. But with each cathartic letdown, we grew. Emphasis on we. The boundaries of a classroom left me feeling that my energy was wrong, overbearing, misdirected, or unworthy. I knew that to honor myself, I needed more. I needed to be able to feel the emotions of kids without looking at the clock and saying, "well, I know you're dealing with a lot, but if I don't get to wrap up this guided reading lesson, I will have failed you". Something about that didn't sit well. In my birth work, I feel a similar streak of emotions surface. It is common for a client to cry during our time together, and part of that feels to me, simply amazing. To cry means that you are releasing. You are exposing a part of you that deserves to be nurtured. You are allowing yourself to be human and react to strong emotions that have just as strong an impact on your physical health as any medicine we might have.